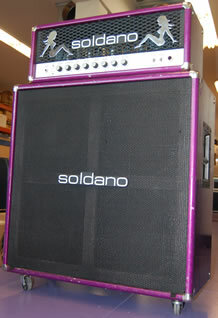 Soldano Amplifiers are the creation of Mike Soldano. Not unlike the story of Paul Reed Smith, Mike had a knack for working with his hands. Soldano also built a guitar during a wood shop class while at college in an Industrial Arts program. He also got an 'A' on his project. Soldano has a long history of tinkering. Throughout high school, he customized his cars for performance. He also built hot rod cars, modding the old machines for shows. When he was 21, he was listening to an Eric Clapton tune and was so inspired by the guitar solo, he decided to learn guitar. His dad handed him a classical guitar, but he couldn't make it sound like the tone Clapton was getting. Mike got himself an electric guitar at a pawn shop and began teaching himself to play. As he took up playing with bands around Seattle, his first guitar amp gave him trouble quite often. Soldano found himself repairing it on a regular basis, which ended up setting the groundwork for his "Quest for Tone". The concept for Soldano Amplifiers started with an experiment in amplifier design he called "Mr. Science". This was the first prototype - nothing more that a piece of plywood with a bunch of components stuck to it. Soldano Custom Amplification was started in Los Angeles, California. Mike relocated there after a stint at a well-known guitar shop in San Francisco modding and repairing guitar amplifiers. He managed to sell an amp to Howard Leese (Heart) in that first year. Things weren't easy though - after a year of barely surviving, he headed home to Seattle for Christmas (the year was 1987). After the holiday, he was ready to call it quits and close the shop. He headed back to L. A., only to find messages from Lou Reed (Velvet Undergound), Vivian Campbell (Def Leppard) and Mike Landau (session guitarist), all wanting one of his amps. Then came Eric Clapton and Mark Knopfler (Dire Straits). Within six months, there was a backlog of orders for Soldano Amplifiers. In addition to the Soldano Amplifiers pioneers above, the list of adopters is truly impressive. When you get some positive steps in the right direction, things start happening. Like they say, news travels fast. Some of the heaviest hitters in Rock have become Soldano Amplifiers users. Guys like George Harrison, Jimmy Page, Peter Frampton, Eddie Van Halen and Ted Nugent. Classic rock legends like The Grateful Dead, Foghat, Jefferson Starship, Aerosmith and Jethro Tull. Even a batch of new rockers and punks like Brad Delson (Linkin Park), Micah Carli (Hawthorne Heights) and Dave Baksh (Sum 41). Clearly, Soldano Amplifiers have been seen and heard on a huge number of concert stages and in our favorite music. Check to see if your guitar hero is listed on the Users of Soldano Guitar Amplifiers and Products page. 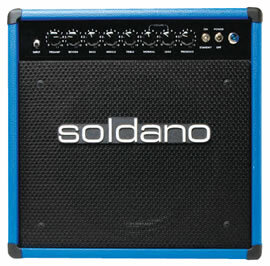 Soldano Amplifiers come in various configurations. Most are available in either 50 Watt or 100 Watt, the Astroverb being the exception at 16 Watts. You can get combo amps in 1x12 and 2x12 setups. Heads can be matched up with 2x12 and 4x12 cabinets, the later available in straight, slant and semi-open options. The tubes used in most of the amps are 5881s or 6L6s for power and 12AX7s for the preamp tubes. Again, the exception being the Astroverb with EL84s. Those aren't your only tube options, but these are the common setups. The available Soldano models are listed below. In the head and cab category, here's the rundown - most of the heads are available in either 50 or 100 Watt models. You choose the head you want based on its number of channels and specific features. For example, you want bare-bones super tone on a "budget", go for the Avenger. You can get it in a 50 Watt model, single channel SLO overdrive only. Add your cabinet of choice and you're set. Want to add a second channel to switch between clean and overdrive? That's the Hot Rod Plus, again available in 50 or 100 Watts. It keeps going from there, ending with the Decatone, which is only available in 100 Watts, but gives you three channels and an effects loop. And the flagship model, around which Soldano made their name, is the SLO model, a two channel, 100 Watt beast, giving you the trademark Super Lead Overdrive (SLO-100). There's a number of variations, and ultimately it comes down to how much amp do you need and what's your budget. Having never tried out any of the Soldano Amplifiers, I can't speak to the tone, but based on some of the famous guitar players that own a Soldano, I'd say they're probably pretty solid amplifiers. Maybe you'll get lucky and find one at a local shop to try out. Guitar Center carries Soldano amplifiers, but since they're pretty pricey, they might not have any on the floor to check out in your area. You might try looking for some smaller music shops close to where you live, but according to the website, there aren't that many independent dealers around the country. As an added bonus, on the site Soldano offers some very good general tube amplifier information. The first suggestion is to spend some time evaluating amps - don't just buy the first thing you try out. Other topics include tube maintenance, tube swapping and tube versus solid state rectifiers. This information is good amplifier help regardless of the guitar amp brand you end up buying.